Let's GET OUT THE VOTE! 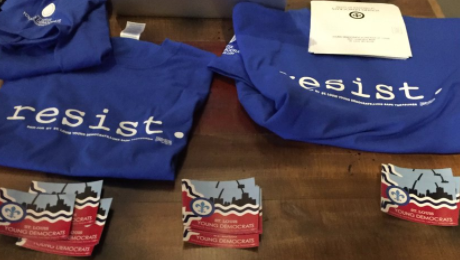 Bring $20 tomorrow so you can canvass in style, wearing your new STL Young Dems RESIST t-shirt! WHAT: Going door-to-door to convince likely voters to show up to the polls on Tuesday and to vote for our endorsed mayoral candidate, Tishaura Jones. WHEN: There will be three 2-hour shifts: (1) 10:00 am - 12:00 pm, (2) 12:00 - 2:00 pm, and (3) 2:00 - 4:00 pm. WHY: To perform our civic duty! Need more convincing? Read this BLOGPOST by St. Louis Young Democrats Vice President, Shayn Prapaisilp! HOW: By just showing up. Tishaura's staff will get us set up with a list and training. We want you to be the best canvasser you can be ... and you learn on the job!